Have you ever bought a bed skirt for your Twin XL sized bed and had to fight with the material to get it into place? If your extra long Twin size bed was ever up against any wall, you know what we're talking about. The extra material isn't needed, so you try and tuck it away so it isn't in the way of anything. Now, you don't have to worry about extra Twin XL bed skirt material if you don't need it. With our Extended Dorm Sized Bed Skirt Panel with Ties - Black you can choose the right amount of fabric and not have to worry about the rest! Choose between 1, 2, 3, or 5 dorm bed skirt panels to properly cover the open space left between your dorm room floor and your TXL mattress. 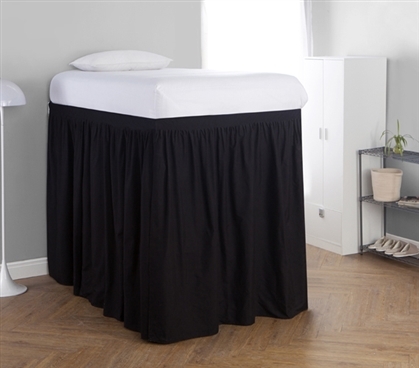 And if you've used the space underneath your Twin extra long bed to store essential college items, you might want these extended black dorm bed panels to keep your dorm room looking clean and tidy. These particular Twin XL bed panels are made to fit lofted or raised dorm beds, so even if there is a big gap to fill, odds are these TXL bed skirt panels can properly cover it. 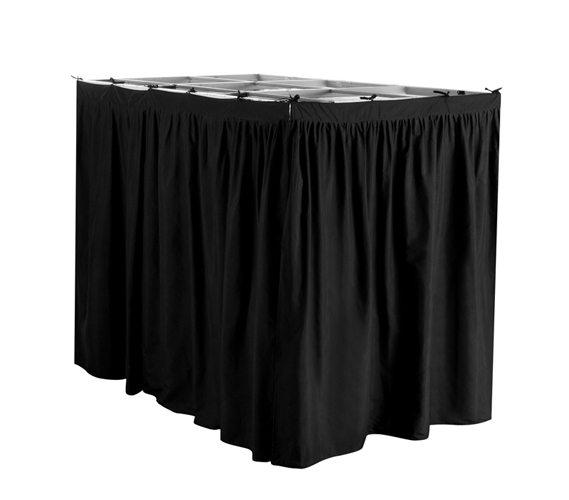 This useful black dorm item is very stylish, which also adds to the overall look of your college dorm room.